5 Axes, 3 drilling heads, 2 tufting heads, CNC automatic Brush Making Machine. This brush making machine has unique and innovative designs, several patents, and superior performance due to the new tufting technology and newly designed platforms. It is suitable for mass production of brooms, toilet brushes, rolling brushes, etc. It can create much higher profits for the customers. 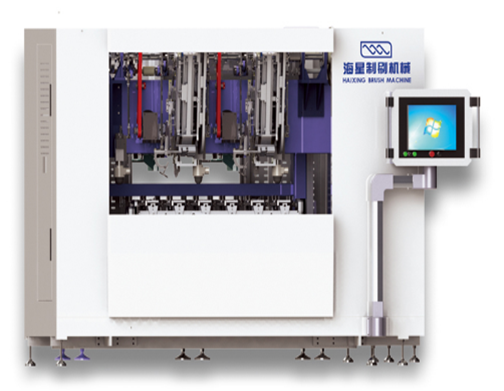 * It is equipped with 3 drilling heads and 2 tufting heads, the tufting speed is as high as 1000 tufts/minute. * 1000 kinds of different programs can be preset in the system and it is easy to create a new program. * It can produce brushes with two or three colors filaments. * By selecting different platforms we can produce brushes with different types and angles. Looking for ideal Brush Drilling And Tufting Machine Manufacturer & supplier ? We have a wide selection at great prices to help you get creative. All the Plastic Broom Making Machine are quality guaranteed. We are China Origin Factory of Brush Drilling Machine. If you have any question, please feel free to contact us.